This Book of Memories memorial website is designed to be a permanent tribute paying tribute to the life and memory of Anna Lucia "Ann" St.Hilaire. It allows family and friends a place to re-visit, interact with each other, share and enhance this tribute for future generations. We are both pleased and proud to provide the Book of Memories to the families of our community. FRAMINGHAM - Anna Lucia "Ann" (McKinnon) St.Hilaire, 91, a local resident for more than 3 years, formerly of N. Andover, MA and Salem, NH, passed away peacefully Tuesday October 31, 2017 at home. She was the wife of the late Leo St.Hilaire who died in 2005 after sharing 59 years of marriage. Born in North Andover, she was the daughter of the late Charles and Florence (Ratcliff) McKinnon. 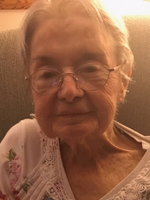 A graduate of Johnson High School with the class of 1944, she worked as an executive secretary for many years with several businesses in the Merrimack Valley area. Mrs. St.Hilaire served as secretary and chairman to the Salem Council on Aging and as past commander of the Ex-POW's Chapter (1) of New Hampshire. She volunteered at Holy Family Hospital and was a CCD Teacher at Mary Queen of Peace Church and loved to knit and crochet afghans and baby blankets. Most important to her were her son Gary and his wife Jackie and her grandchildren. She is survived by her son: Gary L. St.Hilaire and wife Jackie of Framingham, her 6 grandchildren: Gary C. St.Hilaire & wife Tara of Haverhill, Matthew J. St.Hilaire & wife Kendra of Braintree, Jeffrey P. St.Hilaire and fiancée Victoria Mantalos of Brockton, Daniel R. St.Hilaire & wife Julianne of Marlborough, Joseph J. St.Hilaire & wife Danika of Milford and Julie St.Hilaire & fiancé Andrew Heyer of Framingham; 6 great grandchildren; a brother: Charles T. McKinnon, Jr. of Boca Raton, FL., and many nieces and nephews. She was pre-deceased by her daughter: Susan St.Hilaire and her sister-in-law: Germain McKinnon. Visiting hours are Sunday November 5th from 4:00 to 7:00 p.m. at Boyle Bros. Funeral Home, 173 Union Ave., Framingham. A funeral Mass will be celebrated Monday November 6th at 9:00 a.m. at St. Bridget's Church, 830 Worcester Rd. (Rte. 9 Eastbound,) Framingham. Burial will follow in Ridgewood Cemetery, 177 Salem St., North Andover. The family suggests memorial donations be made in place of flowers to: the Little Sisters of the Poor, 186 Highland Avenue, Somerville, MA. 02143. Please visit www.boylebrothers.com for memorial page and further information.